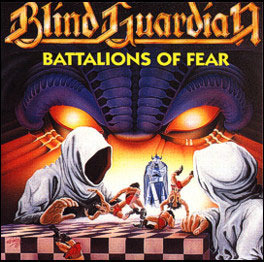 Battalions of Fear is the debut album by German metal band Blind Guardian. It was released in 1988 and is a straightforward metal album. The album is a raw and unpolished speed metal effort that touches on thrash metal. This album lacks many of the stylistic flourishes that would mark the band's music in later years. It was remastered, remixed and re-released on 15 June 2007, with the whole first demo tape, Symphonies of Doom, of the band (at the time called Lucifer's Heritage) as part of the bonus tracks. It is a significant power metal album along with Stratovarius's Fright Night and Helloween's first albums.